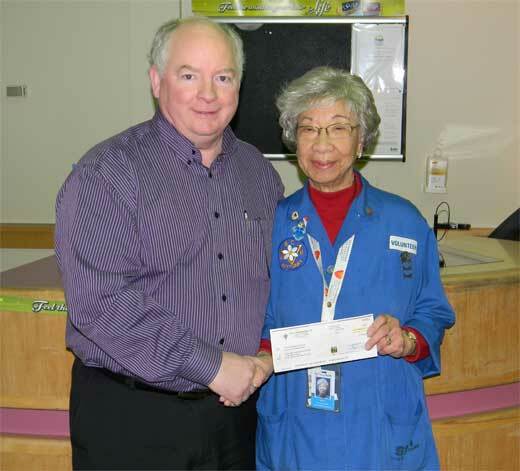 Surrey Memorial Hospital Auxiliary, KDS Construction Ltd News. A Good Samaritan has come to the rescue of a hospital charity that lost $5,000 worth of lottery tickets to the clutches of a thief. Marvin Kale, vice-president of KDS Construction, has come forward with a cheque for the SMH auxiliary. Kale says he stepped up to help the auxiliary after reading a story about the burglary in the Now. "It's disgusting what some people do," Kale said Wednesday. Kale said KDS Construction has won contracts at SMH and other Fraser Health facilities and so it's only fitting that the company contributes to the hospital auxiliary and its good works. The company is currently building the new family birthing unit at the hospital, among other projects. Betty Sing, lottery co-ordinator for the SMH auxiliary, was elated by the news of the company's generosity. "I just can't believe that anybody would do that, it's just wonderful to hear that." Just a few days before Christmas, a thief or thieves jimmied the lock on a cupboard where volunteers kept the lottery tickets. The storage compartment contained a batch of scratch tickets, ranging in value from $1 to $20, plus $500 in cash. The SMH auxiliary operates a lottery booth in a corner of the hospital cafeteria. Sing reported the burglary to the Surrey RCMP and the B.C. Lottery Corporation, but there's been no trace of the tickets. A few days ago, B.C. Lottery Corporation spokesman Chris Fairclough told the Now BCLC is sympathetic to the situation, but the company can't replace stolen lottery tickets. The auxiliary bought another batch of tickets to sell, but was stuck with the $5,000 loss. Since the SMH auxiliary only makes five cents per lottery ticket sold, that sum represents a year of profits down the drain. The funds raised by the sale of tickets go toward the hospital's patient comfort program, which provides video games, craft supplies and personal care products to patients to make their hospital stay a bit more pleasant.